Texas Rangers second baseman Ian Kinsler has been activated from the Disabled List and bat leadoff for the Rangers in Toronto. Kinsler, no stranger to injury has missed nearly a month with an intercostal strain and will return to face RA Dickey and the Blue Jays. The 30-year-old second baseman has stayed healthy the past two seasons, playing in 155 and 157 games after playing in 130 or less the previous four out of five seasons. 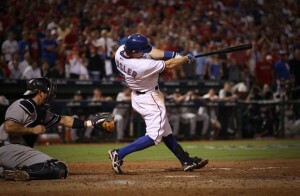 In 2013, Kinsler had 7 HR and 20 RBI, with an above norm .302 BA and .389 OBP in 180 ABs. In response to reactivating their long-term second baseman, the Rangers optioned infielder Leury Garcia back to AAA Round Rock, showing a vote of confidence in super-prospect Jurickson Profar, in the process. Garcia played in 25 games and managed 57 at bats during his stint for the Rangers, hitting just .192/.236 with one extra base hit, RBI and stolen base in the process. Garcia is just 22 years old and was the logical demotion instead of Profar, who at age 20, has shown he more belongs. Profar will remain with Texas in the form of a utility man. Despite Adrian Beltre, Elvis Andrus and Kinsler having their positions locked down, Andrus has struggled at the plate, Lance Berkman will likely only face righties as a DH and Profar should see time at third, short and second when needed. For his part, Profar has a .278/.326/.718 split in 87 at bats. Though he has hit a pair of home runs and driven in seven RBI in that span, Profar has also struck out 16 times, showing he needs more time at the MLB level to try to adjust to MLB pitching. Texas now has plenty of flexibility in the infield with Kinsler’s return.